This interactive bedtime story proves nighttime isn't scary at all. The gentle journey from sunset to sunrise shows even the youngest children the magic of the nighttime sky—and lets them make magic happen! A companion to the popular and acclaimed Tap the Magic Tree. What happens while you're sleeping? With lush, beautiful watercolors and cut-paper collage, Christie Matheson reveals the magic of the nighttime sky, using the same kinds of toddler-perfect interactive elements as her acclaimed Tap the Magic Tree. Wave good-bye to the sun, gently press the firefly, make a wish on a star, rub the owls on their heads, and . . . shhhh. No two readings of this book will be the same. That along with the gentle, soothing rhythm, makes Touch the Brightest Star a bedtime winner—no matter how many times you and your child read it. 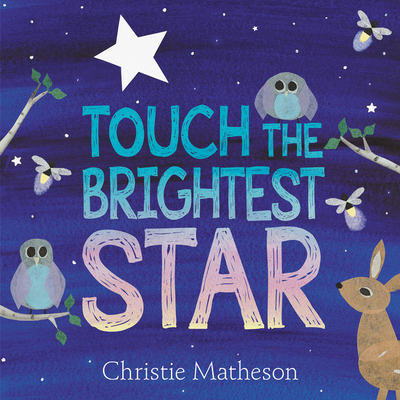 Christie Matheson is the author of the acclaimed picture books Tap the Magic Tree, Touch the Brightest Star, and Plant the Tiny Seed. Her three young children like to take her birding in the Presidio of San Francisco.